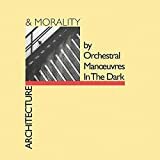 If you haven’t heard, OMD were planning on some Architecture & Morality gigs this Autumn. These gigs have now been delayed, until early 2007. This is fantastic news for me, as I’ve never seen this wonderful band before. Plus it’ll be a chance to hear the wonderful Souvenir, played live along with all the other album tracks.